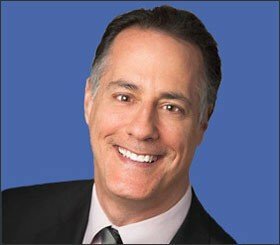 Winner Take Most - Can Firms Gain a Large Share of the Market?Winner Take Most - Can Firms Gain a Large Share of the Market? Income inequality has many economic and societal impacts. When more wealth is concentrated in fewer hands, this can negatively impact aggregate demand as a large percentage of marginal dollars earned are saved versus spent. And since one person’s spending is another person’s income, a growing pool of savings will lower aggregate demand unless one or more sectors of the economy spend more than it earns as output will go unsold and have to be marked down for it to clear. This will lead to a cutback in investment to adjust to lower aggregate demand and will ultimately spill over to either a lessening of job growth or a contraction if conditions become recessionary. Absent some stabilizing influence, this can lead to a negative feedback loop in which lower production leads to fewer jobs which lead to less spendable income which leads to more cutbacks, etc. And from a housing perspective, this will usually lead to a reduction in the demand for housing as a result of a slow growing or contractionary economy and the impact this has on disposable income. While the vast majority of our population is strongly encouraged to save more for retirement and a rainy day, if everyone started to do this more aggressively, then spending would leak out of the economy and create the negative feedback loop discussed above. That is why fiscal involvement in the economy can be so important as it can be a counter-cyclical source of demand to make up for savings leakages. A topic for another day. A lot of work has been done trying to quantify the degree of income and wealth inequality by deciles of wage cohorts. Far less work has been done, or at least publicized, however, as to the causes of this large and growing inequality. I recently read a short research paper that delves into this and posits an interesting and common sense oriented theory. 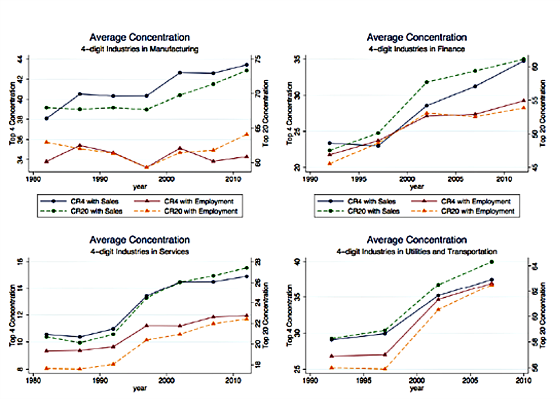 The authors researched whether the major industries comprising most of the private United States economy are becoming more or less concentrated and how the labor share of output has changed. They have concluded that virtually all industries have become more concentrated, particularly for manufacturing, and this has translated to higher productivity, profitability, and less of the pie going to labor. The charts below show how four major industries in the U.S. have become more concentrated over the years. The chart shows the share for the top four and top 20 firms in each industry. The sales concentration in manufacturing for the top four firms has gone from 38% to 43%, in finance 24% to 35%, services 11% to 15%, utilities 29% to 37%, retail trade 15% to 30% (Amazon? ), and wholesale trade from 22% to 28%. Employment concentration has grown more slowly which, according to the authors, “suggest that firms may attain large market shares with a relatively small workforce, as exemplified by Facebook and Google.” I will discuss this phenomenon shortly. While in aggregate the share of output going to labor has dropped significantly there is interestingly very little decline in the labor share for average firms. This is how the authors explain the phenomenon of the labor share having changed immaterially for the average firm but declining rather significantly for the economy overall. Companies like Google and Facebook are great examples of this. The authors refer to these types of companies as superstar firms. They have market values far in excess of the capital invested in the businesses. For example, Google’s price to book value is approximately 4 while Facebook’s exceeds 6. Salesforces is north of 8, while Exxon Mobil, which is a highly capital intensive company, has a price to book of approximately 2. 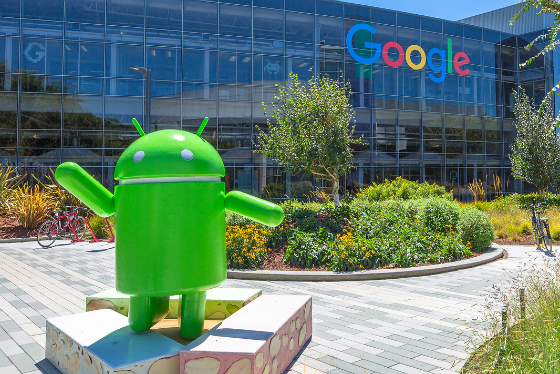 The market is rewarding companies like Google and Facebook with a much higher equity value than the actual equity invested because of how profitable they are and because of the relatively small capital needed to maintain its market dominance and return on capital. These companies have high fixed costs but are enormously profitable at the margin. They have incredibly valuable and powerful network effects that create extraordinary barriers to entry and mind boggling scalability. It is extremely difficult to start and scale a business such that it ends up being market dominant. But for the few that have been able to pass the freedom line, they have been able to achieve a critical mass to attract customers to their networks because that is where the people are with whom you want to communicate, do business with, or with whom you just want to hang out. There becomes a big cost to not being in the ecosystem. Try competing with Amazon, Google, Facebook, Microsoft, Apple, or Salesforce, just to name some of the notable monsters with huge network effects and enormous barriers to entry. The larger customer base makes it advantageous to attract new members to the network and these new members have relatively low acquisition costs, have high lifetime value because they stay for a long time, and are very profitable. This profitability allows the firms to reinvest in the ecosystem by enhancing its products, service, customer engagement, information, etc. to create even greater barriers to entry and still remain highly profitable. These firms are able to attract and retain highly valuable people but the relatively low labor intensity allows the firms to pay very competitive compensation but still have an unusually high percentage of the value added flow through to the shareholders and the top executives. 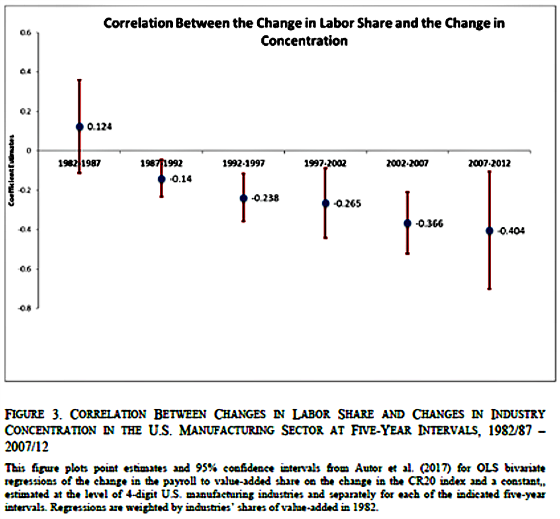 The following chart is truly the money chart as it shows how the correlation becomes increasingly more negative between the share of labor output and industry concentration. It takes about five years for increasing levels of concentration to translate to less share of the pie going to labor, but once it does, the trend accelerates such that the more highly concentrated an industry becomes, the less share of output that flows to labor. I would have expected average wages to be higher for the most productive superstar firms, but apparently, this is not the case. I wrote last week about the futility of Donald Trump’s desire to have the United States become the dominant manufacturing country in the world. We are not far behind China in terms of the dollar value of manufacturing output, but we do this with a very small percentage of our workforce dedicated to it. We have become ruthlessly efficient and part of the reason for this is the increasing concentration of manufacturing among fewer large firms that are extraordinarily productive. This has come at the expense of labor’s share of output. With the increasing adoption of robots and more high-tech equipment and systems, this trend is not going to reverse. From a real estate investor’s perspective, I always see the world through the prism of interest rates and how major trends might impact the direction of rates in the future. I continue to see more of the same, which is lower for longer. Unless labor’s share of output begins to reverse materially I think this will continue to support my belief that economic growth will be in the 2% range, wage growth will be tepid, and interest rates will remain low with short-term rates not exceeding 2% over the next five years and the 10-year Treasury yield hovering between 2% and 3%, although there is a compelling argument that when the next recession hits we could go down to between 1% and 1.50%. Technology, robots, automation, cloud computing, artificial intelligence, and the increasing sophistication of firms of aggregating these tools, as well as a host of others, and deploying them effectively should continue to create more of a “winner take most” economy and keep labor’s share of output at relatively low levels. This, combined with an aging global population, should continue to keep growth subdued and interest rates at historically low levels. Do you agree that economic growth will be in the 2% range with the survival of only the fittest firms? I welcome your thoughts.